Once you’ve determined who your competitors are, it’s time to get a brief overview of their social media strategy. This can be done in three quick and easy steps. Step 1: Where are your competitors “hanging out”? Before you start diving into researching your competitors, it’s important to do a quick search for where they are present (makes sense, right?). Are they on Instagram? Twitter? Facebook? Youtube? Knowing what channels your competitors are active on will allow for a more comprehensive understanding of their social media strategy. Start with searching for your competitors on the following popular social media sites: Facebook, Twitter, Google+, LinkedIn, YouTube, Pinterest, Tumblr, Myspace, and Instagram. Step 2: Should you be “hanging out” with them? Once you’ve determined where your competitors are “hanging out”, the next step is to consider if you should also be present on these networks (if you aren’t already). If your competitors are active on a social media channel and have a good following, this should be a huge red flag alerting you to be engaged on that channel as well. Step 3: How are your competitors presenting themselves? Almost all social media sites give you the option to use images to customize your page. Keep an eye out for how your competitors are taking advantage of this feature. You should also be paying close attention to your competitor’s descriptions; to the language they are using. What keywords are they choosing to describe their company? If you like what you see, then pull inspiration from their descriptions and incorporate what’s appealing into your own. **Changes to descriptions are also a great way to gain insight into company rebranding. Because companies will often promote new products in their descriptions, keeping a close eye on changes can alert you of new features or products your competitors are rolling out. Now that you’ve done the preliminary research, let’s focus on two of the most popular social media sites: Twitter and Facebook. Understanding how to strategically research your competitors on these channels will not only save you time, but will also give you a very good idea of what their social media strategies consist of. As a self-confessed cell phone addict, today we’ll be turning to a number of smartphone companies to gain a deeper understanding of competitive research on these two networks. While reading hundreds of blog posts and ebooks on how to use Facebook for business can be useful, I’ve found the most effective method is seeing what works well for others. I allow my competitors to spend countless hours experimenting with what Facebook strategy works best (because heaven knows I ain’t got time for that)! In just four easy steps, you can effectively research your competitors, determine the ups and downs of their Facebook strategy, and implement what works into your own. Before you dive into the deep end of researching, take a dip into the shallow waters and simply look at how many likes your competitor’s page has. This is a good starting point and is an indication of whether or not their Facebook strategy is successful and worthy of borrowing. There will be times when a company has an impressive following on Facebook, but their Facebook engagement rate is just plain awful. With that said, looking at numbers is not the sole determining factor of who is on their Facebook A-game, but it’s a good place to begin. Step 2: How engaging are they? Having people follow your company page doesn’t get you customers. Unless a person is actually engaging on your Facebook page by liking, commenting, and sharing your content, the chances of showing up in their newsfeed are slim. For this reason, researching into how engaged your competitors’ followers are is a much stronger indication of whether or not their Facebook strategy is working. A measurement of engagement that I find most useful is post engagement rate (the number of likes, comments, and shares of posts per thousand page likes), which can be seen in the Rival IQ graph below. 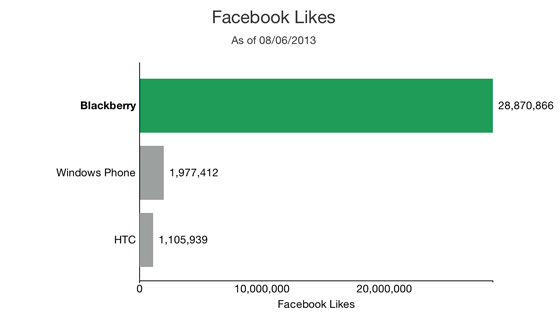 Earlier we saw that Blackberry was slaying the competition in number of page likes. However, when researching a little deeper, we see that the same can not be said of their post engagement rate. 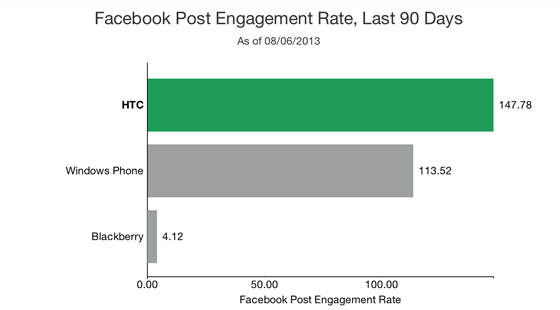 Blackberry has almost 26x the number of Facebook page likes than HTC, but HTC’s post engagement rate is 36x higher than Blackberry’s! 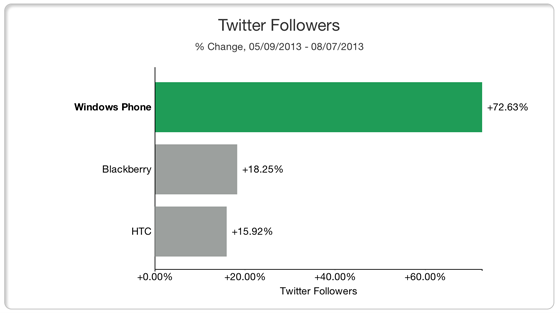 If I were Blackberry, I’d be hanging my head in shame whilst I scrambled to figure out why HTC is annihilating me. Step 3: What type of content are they posting? Once you’ve determined the number of page likes your competitors have and their post engagement rates, you should have a pretty good idea of who your Facebook marketing role models are. Now it’s time for the fun part – researching into what exactly makes them Facebook rockstars. Are they asking their followers questions to increase engagement? What comprises the majority of their posts – videos, pictures, or text? What are they doing that is innovative and creative that stands out? Is the content they are posting their own or is it sourced? Are they resharing their followers’ posts? Are they posting discount codes or competitions? How often? 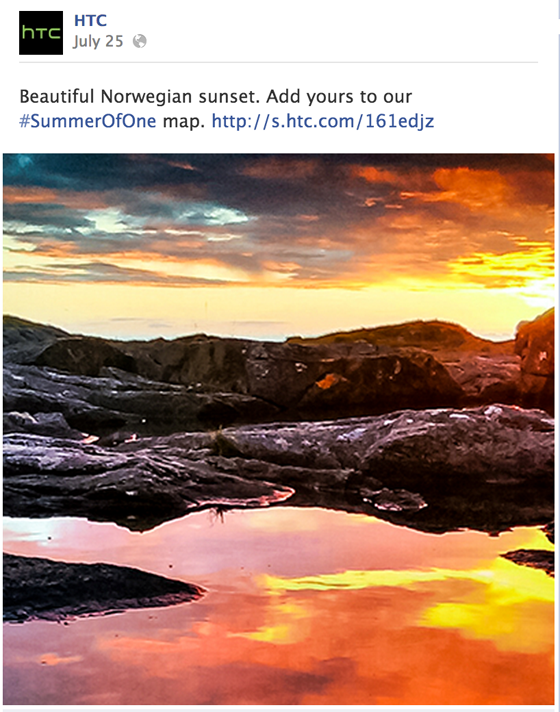 Now that Facebook supports hashtag campaigns, HTC has been taking full advantage of this new feature by asking their followers to share their favorite sunset photos taken with their HTC. This simple “ask” results in higher engagement, exposure of their high quality camera feature, and their Facebook page is filled with visually appealing sunset pictures. Talk about a win, win situation! If HTC was my competitor, I’d definitely be getting inspired to start my own hashtag campaign. Now that you have completed your research into your competitors’ Facebook strategy, adopt the things that work and leave out those that don’t. If a certain type of content your competitors are posting is getting a lot of likes, comments, and shares – chances are if you post similar content, you’ll see an increase in engagement as well. 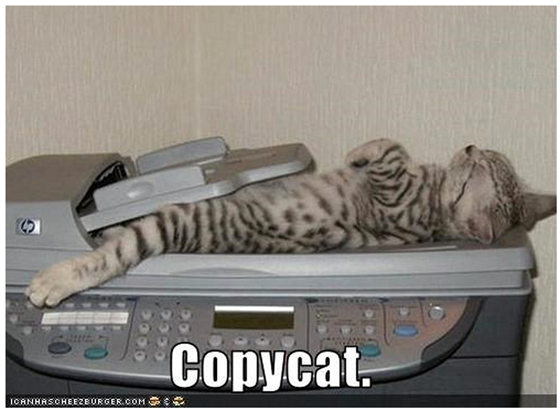 Just be sure that you are getting ideas from your competitors, but always adding your own creative and unique spin. According to Top Rank Marketing, 50% of Twitter users are more likely to purchase from brands they follow. If that’s not reason enough to start getting your Twitter act together, I’m not sure what is! However, with the 140 character limitation and the “noise” that is often associated with Twitter, being successful on this channel can be very challenging. Competitive research is the secret weapon in your back pocket. Your competitors’ followers are interested in what your competitors are doing, and by default have an interest in what you are doing. Take advantage of this by researching and learning more about the people following your competition. Learning the demographics of their followers allows you to gain new insight into who you should be marketing your product to in the future. Try a tool like Followerwonk to determine where their followers are located, their inferred genders, when they are most active, and how long they have been active on Twitter. Looking at the @ replies lets you see what people are liking or disliking about your competitors. Again, this is another place to learn from your competitors successes and failures. 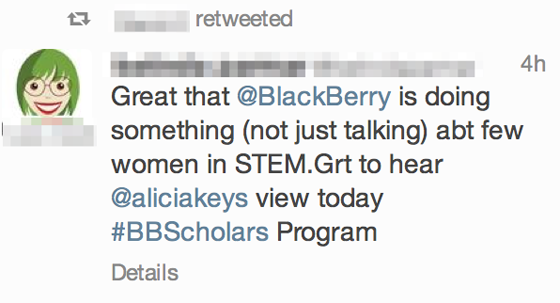 Blackberry offers a scholarship for women with goals of a career in the tech industry – as a result, there are countless people praising Blackberry’s generosity on Twitter. On the flip side, a number of tweets reveal peoples’ frustrations with the Twitter app on Blackberry. As a Blackberry competitor, I would be trying my very best to ensure that every fangirl could tweet @JustinBieber with ease. Step 3: How engaging are they? Just like we did for Facebook, our final step is to scope out what your competitors are doing to promote engagement on Twitter. Because of how easy it is to communicate and interact on Twitter, your main focus should be on the exchange of conversation between your competitor and their followers. 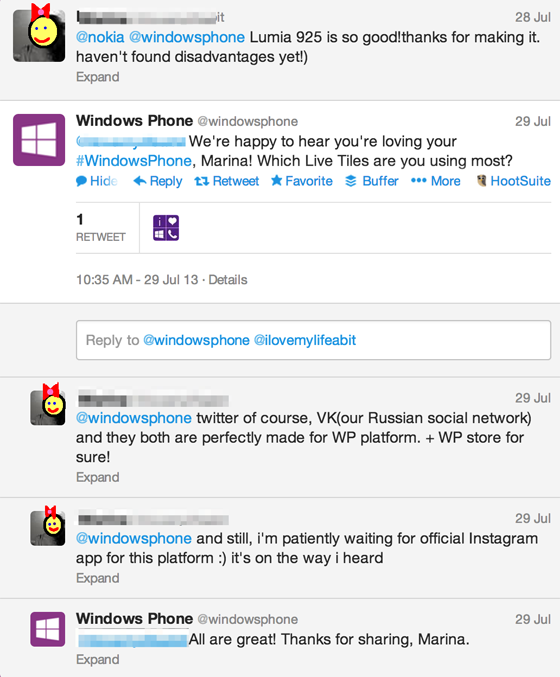 For example, Windows Phone does an outstanding job at holding long Twitter conversations with their followers. Nearly their entire feed is comprised of these correspondences. 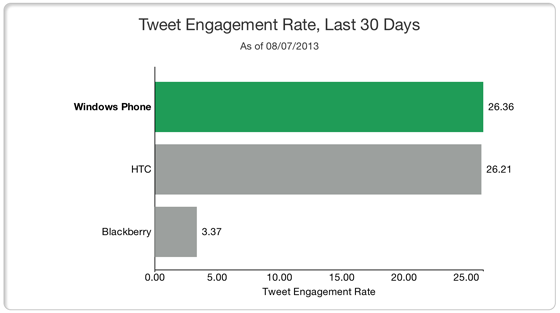 These efforts in engagement can be seen by looking at their Twitter post engagement rate. With the impressive increase in Twitter followers that Windows Phone has recently experienced, this approach to Twitter would surely spark my interest as a competitor. Now that you’ve learned how to research your competitors’ social media strategy, it’s time to start getting to work! Do keep in mind that while your initial competitive research will provide you with a lot of useful information, it’s important to continue to monitor them on a regular basis. This will give you insight into any changes they are making to their strategy. Leveraging a marketing intelligence tool like Rival IQ (yes, this is a shameless plug) allows you to monitor changes your competitors have made quickly and effectively, ensuring you don’t miss anything important. What do you look for when researching your competitors? I’d love to hear your thoughts in the comment section below!